Autumn Now Has a Buddy Named "Cliff Kringle!" Both fur seals are eating well and putting on weight! They're also helping scientists at the Center understand a potentially lethal disease to fur seals - hookworm. Cliff Kringle and Autumn have both tested negative for hookworm larvae in their feces, providing a baseline for future studies. In the wild, fur seal pups can become infected with hookworm through their mother’s milk and this intestinal parasite can cause high pup mortality. By studying fur seal patients, scientists are now getting a better look at this disease. In the meantime, Cliff Kringle and Autumn continue to thrive, hookworm free, and we hope to get them back out to the ocean soon! 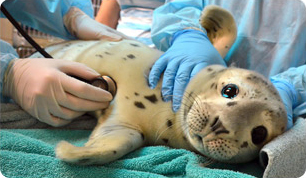 Visit our science page to read about other marine mammal health studies. Acevedo-Whitehouse, K., Spraker, T.R., Lyons, E., Melin, S.R., Gulland, F., Delong R.L., and Amos, W. 2006. Contrasting effects of heterozygosity on survival and hookworm resistance in California sea lion pups. Molecular Ecology 15(7): 1973-1982. Castinel, A., Duignan, P. J., Pomroy, W. E., Lyons, E. T., Nadler, S. A., Dailey, M. D., Wilkinson, I. S., and Chilvers, B. L. 2006. First report and characterization of adult Uncinaria spp. in New Zealand sea lion (Phocarctos hookeri) pups from the Auckland Islands, New Zealand. Parasitology Research 98(4): 304-309. Lyons, E. T., Melin, S. R., DeLong, R. L., Orr, A. J., Gulland, F. M., and Tolliver, S. C. 2001. Current prevalence of adult Uncinaria spp. in northern fur seal (Callorhinus ursinus) and California sea lion (Zalophus californianus) pups on San Miguel Island, California, with notes on the biology of these hookworms. Veterinary Parasitology 97: 309-318. 12/22/11 - "Movin' on Up"
Like the theme song "Movin on Up" from the classic television show "The Jeffersons," Cliff Kringle and Autumn have indeed "moved up" this week! The two keep each other company now 24/7 swimming in a much bigger and deeper pool. Veterinarians moved the two to one of the new pools that were built earlier this year in an effort to encourage their natural behaviors of diving and grooming. Each continues to eat up to 3 lb. of fish a day. "Cliff Kringle" snacks on a herring at The Marine Mammal Center. Autumn and Cliff Kringle recently received a special treat - live fish! According to veterinarians, the two really loved chasing the Shiners in their pool! Come back to this page for future updates on the two and read about Lapawi, another fur seal patient we rescued earlier this year that was foudn covered in oil. Autumn continues on her road to recovery and is just starting to eat some fish on her own! This week she got a roommate - another Northern fur seal just like her! "Cliff Kringle" was rescued after he was found on a beach malnourished and suffering from pneumonia. He currently weighs a little over 12 pounds and veterinarians are keeping a watchful eye on him as he remains in stable condition. Autumn and Cliff Kringle have spent the past couple of days swimming together in their pool. Little Autumn is starting to gain weight! She orginally weighed 4.5kg upon admit and now is up to 6.0kg! She still does not take to eating fish on her own, but definitely loves her tube-feedings which happen four times a day. When she's not being fed, Autumn likes to spend her days grooming herself in the pool and then hauling out and lounging on a heating pad. Autumn continues to eagerly take her meals by tube despite the enticing offering of live fish this week by animal care staff. Volunteers and staff report that she's feisty and loves to bite her tube - a good sign of vitality! Check back here for future updates on our compact and furry fur seal patient! Veterinarians continue medical care for Autumn at our hospital. Initial medical tests have not shown any major parasitic diseases, which is good! She still is not eating on her own, but staff and volunteers do offer her small whole fish daily in case she gets a hankering for one! Currently, she is receiving daily meals via a tube consisting of three parts ground up herring mixed with water and one part salmon oil (to help her gain weight!) During the day, Autumn enjoys swimming in one of the main pools and can be seen grooming herself - a natural habit! At night, veterinarians transfer her to a special condo which provides her warmth against the chilly night winds in the Marin Headlands. In another week, veterinarians plan on offering her small live fish to entice her to begin to eat on her own. As the seasons change, so do our patients. Aptly named Autumn, a Northern fur seal, came into our midst late last week. This female pup was rescued at Moonstone Beach, Cambria and then kept overnight at one of our satellite facilities before arriving at the Center on Friday, November 4. Northern fur seals are typically born mid-summer and can weigh 4.5Kg or more at birth - little Autumn weighed just 5kg when she arrived - barely more than her birth weight yet much older than a new born! As pups are weaned, they either find the resources they need, or they don't and if they don't they sometimes strand, emaciated and starving. For little Autumn, the first few days with us are about settling in and stabilizing her. So far she's being tube-fed as she's not interested in fish, but she's grooming and swimming well. However, with patients this fragile it is touch and go, and because she is so young and so little, she is being treated in our special ICU ward, away from the larger seal and sea lion patients - the more quiet and calm we can provide, the better her chances. Northern fur seals are listed as vulnerable on the IUCN Red List. You can help other marine mammal patients like Autumn at The Marine Mammal Center by Adopting-a-Seal today or making a donation! Check out our newest adoptee - Silent Knight!